A long overdue shout out to everyone at Bad Axe. Received my Stiletto in the mail last week and put it to use (alongside its sister the 12" hybrid) cutting small box joints and dovetails. Nothing in my till comes close to these two in terms of consistency and ease of cut. Worth every penny. Thanks for the fantastic saws and excellent service! Mark, Just wanted to let you know I have my BadAxe miter saw (with the bog oak handle) working hard in the shop. It has paired up nicely with my Craftsman 3646 miter box and my cuts are smooth as can be. Thanks again for a wonderful saw! 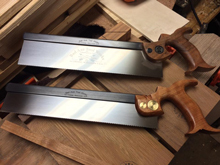 I just took delivery of a Stiletto dovetail saw, which I ordered to match my 16" Tenon saw. There are a few things I like about the BadAxe saws. I have big hands, so the ability to customize the handle size is fantastic. The saws just seem sharper and cut better than other saws I have used. 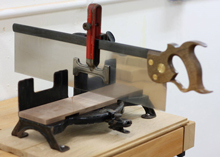 Looks are also important, most other saws look the same. I can order my BadAxe how I want, not according to what someone else things a saw should look like. 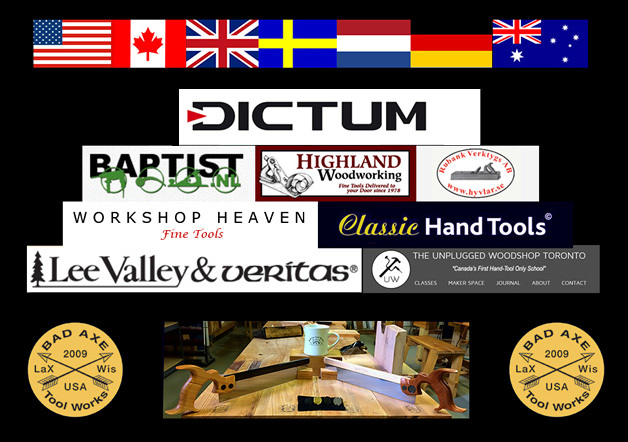 Thank you for making the best saws on the planet!
. . . I made another mark, held my Bad Axe with a nice relaxed grip, gave it a "go ahead" nudge and... it glided nearly the full length of the blade with a beautiful, clean starting cut, several relaxed strokes later I was through a 1x6 oak board. When I put my combo square to the cut end I was shocked to find I had made my first ever "dead square" cut! Yep, that just happened! Then.... sunlight flooded my workshop and I heard the angels singing, it was glorious! I received my saws from Mark today. They are beautiful tools--they have soul. I tested the Tenon on some 12/4 Maple and the saw performed beautifully. I had never used a saw this big before and the cut was straight and plumb on the first try. Thanks Mark! My new 12" carcass and 16" "jack" saws arrived yesterday, and holy crap they are better than I had hoped for. What an absolute delight to use. Thank you thank you thank you so much for deciding to build saws. Bad Axe Saws are distributed widely here at home and internationally. The list below reflects our friends up north and across the Atlantic. Phone: 01473 784983; Email: click here. Phone: +44 (0)1295 678941; Email: whsales@workshopheaven.com. Hyvlar.se Rubank Verktygs AB 123 43 Farsta, Sverige; Phone: 08-724 75 10 Email: click here.